Deadline: This project’s deadline is Monday, January 21, 2019, at 11:59pm (that is, just before midnight) wherever you are on. It was posted around noon, California time, on Thursday, January 17, 2019. 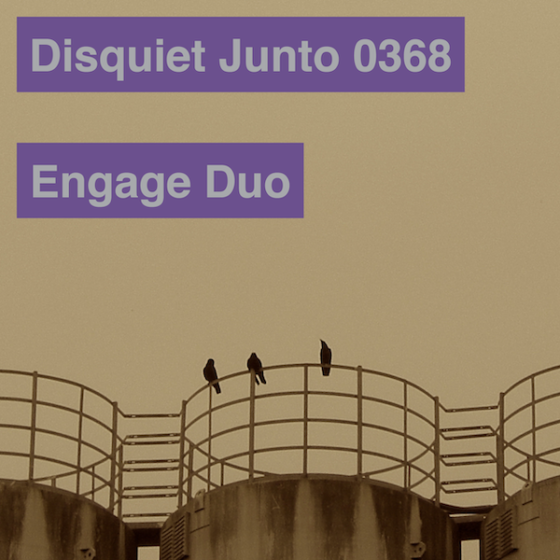 Step 1: This week’s Disquiet Junto project is the second in a sequence that explores and encourages asynchronous collaboration. This week you will be adding music to a pre-existing track, which you will source from the previous week’s Junto project (disquiet.com/0367). Note that you aren’t creating a duet — you’re creating the second third of what will eventually be a trio. Keep this in mind. Step 1: Include “disquiet0368” (no spaces or quotation marks) in the name of your track. Step 2: If your audio-hosting platform allows for tags, be sure to also include the project tag “disquiet0368” (no spaces or quotation marks). If you’re posting on SoundCloud in particular, this is essential to subsequent location of tracks for the creation a project playlist. Length: Your finished track will be roughly the length of the track you chose to add to. Title/Tag: When posting your track, please include “disquiet0368” in the title of the track, and where applicable (on SoundCloud, for example) as a tag. Download: Please for this project be sure to set your track as downloadable and allowing for attributed remixing (i.e., a Creative Commons license permitting non-commercial sharing with attribution, allowing for derivatives).